In challenging economic times, Jo Cursley an academic from the Marchmont Observatory, argues the case for investment in prisoner rehabilitation. A group of prisoners work together to put on a concert in Italy: for the first time two of them have begun to come out of their cells for activities. In the Netherlands, a narrator begins the play, a man who has found it difficult to relate to others but who is now part of the group. 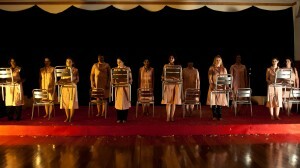 In Portugal, a group of prisoners perform a routine with chairs which they pick up and which suddenly seem to become heavy. We watch in silence as the symbolism of their guilt and anxiety becomes apparent. There are cathartic tears on the stage. The idea of rehabilitation here is linked to the phrase “help them lead law abiding and useful lives in custody and after release.” The implication is that prior to prison they lacked the skills to do this.. Rehabilitation in all its forms is thus seen as providing an intervention which seeks to repair this lack of skills; that somehow, rehabilitation will provide the route which will make them behave in a more socially acceptable way in the future. However, I argue that having a rehabilitative model which only focuses on improving social skills misses the point. To make a rehabilitative step change there needs to be self-belief, a feeling that something significant has changed which will lead to a better future for them. As those in prisons often have deep rooted issues with their self- esteem, the rehabilitative intervention has to ensure it provides space for the possibilities for this to happen. My research and that of others strongly indicates that any programme should be focused on the personal growth of the prisoner which enables them to re-vision their future; a future that doesn’t include prison. While this sounds like it might be expensive, surely it is cheaper than sending prisoners out unchanged and wringing one’s hands when they appear again through that revolving door a short time later. If a focus on raising self esteem, and also providing offenders with the space for a re-consideration of their future selves is needed in order for offenders to have any chance of a crime free future, then how should this be provided? An international prison project I have been involved with seems to have the answers. The project, based around arts performances using the SEPE (Supporting Employability and Personal Effectiveness) award, has been developed by the University of Exeter and accredited through Edexcel. Working with Superact, a not for profit organisation, Exeter University laid the foundations for a training pack which has been used by Superact who have trained artists and performers in each country to deliver the project. The all important feedback the prisoners receive as a result of participating in the programme is based on their employability skills; ability to communicate, work in a team, focus on a task, solve problems. The resulting increased self-awareness has led to their re-considering the possibilities of using their newly awakened social capital in their future lives, post prison. These results show rehabilitation in action. The possibility of this project to awaken, settle, and prepare offenders for their future lives has been recognised by Portugal and the Netherlands in particular. In both cases the projects have been brought to people in government to see the performances and to discuss the benefits. Indeed in Portugal , the Government representative was so impressed it is now going to be taken to perform to the whole of the Portuguese Parliament. Yet the link with rehabilitation and the Arts are uneasy bedfellows in Britain, where the British press derides them as wasting money on “fun”. Indeed the Arts were not mentioned by the Ministry of Justice’s Report “Breaking the Cycle” (2010), yet the profundity of development in these offender participants indicates that this is just what this project is likely to do. This entry was posted in Uncategorized and tagged justice, law, marchmont, prisoners, rehabilitation on 5th Apr, 2012 by rwfm201.